Welcome to TAY Board Game Night! Each week I hope to bring you a new board game to try out, throw in a mini blurb about why you should play this game, and then add some alternate playstyles or challenges for you to try while you play! Make sure you and comment on challenges you completed, alternative game modes, or just a funny story with the game. Above all let us know how well you enjoyed it! 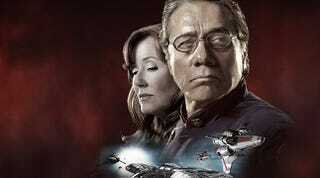 Battlestar Galactica is a significant pop and geek culture phenomenon. Despite it the title series being concluded several years ago, its started spin-offs, merchandise, and has kept the fire in its fans hearts. The core of the story for those not in the know; Earth has just been taken over by the Cylons, a race of robotic humanoids bent on the destruction of humanity. The Galactica is just one of the last surviving ships of the human race, but notable for being one of the oldest and a battle cruiser. It travels space looking for a new home for humanity while being hunted by the cylon threat. Things aren’t that simple though, as the humans on board begin playing politics and internal strife makes things on this trip a little bumpy. To make things worse, there are cylons on the ship masquerading as humans! The wonderful thing about this? The board game captures this feeling of enemies everywhere perfectly! The core of Battlestar is that players will each be playing a character from the show with their own abilities and skills. Together you and your friends (or soon to be enemies) will be attempting to resolve events to get Galactica one step closer to safety. However, players are given loyalty cards, which can secretly make them a cylon. All of sudden, every player is now suspicious of each other, and every play is scrutinized for some tense interpersonal play. Did Bob not commit enough skill cards because he didn’t have them? Or is he trying to sabotage the event? Did Mary really make the best decision as the President? Even though you’re already low on food? Perhaps its time for you to take charge! Watch with glee as your clearly human opponents claw for survival while you slowly put your cylon machinations to work. If you want to learn, there is a wonderful video tutorial and pdfs of the rules at Fantasy Flight Games website. The game is already chock full of extra modes and settings, so just pick one! As always make sure to come back and let me know what you think and what you played in the comments below.